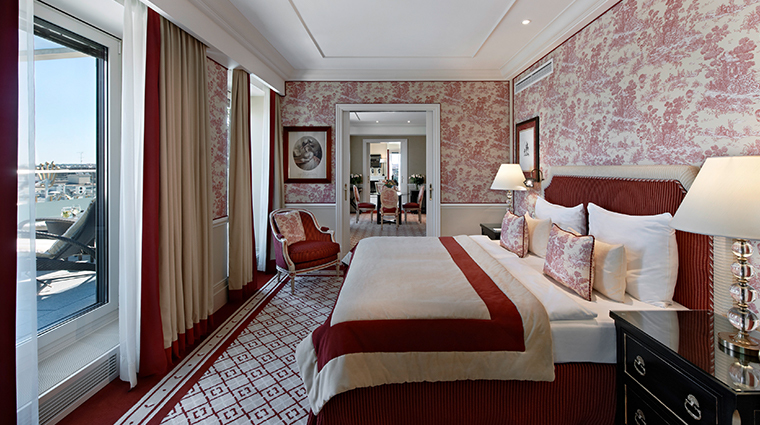 A step back to the heights of belle époque Vienna, Hotel Sacher Wien manages to maintain its historic charm while innovating with exquisite personalized service throughout the sprawling levels of its renowned property. 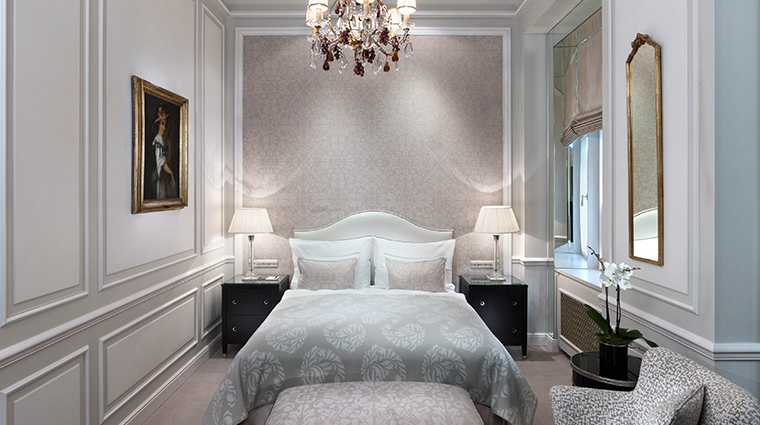 As one of the only Viennese hotels still owned and run by a local family, Hotel Sacher is infused with red-velvet-covered and silk-damask-dressed personal touches that the Gürtlers have proudly spotlighted since 1934. Every need is met here. 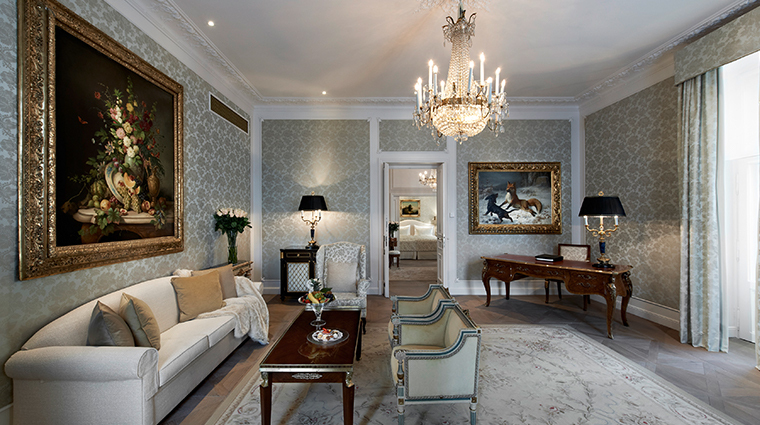 From a private check-in desk in an enclave beyond the concierge area to exclusive access to famous Hotel Sacher cafés and restaurants, the priority here is on a comfortable and discreet experience for you. 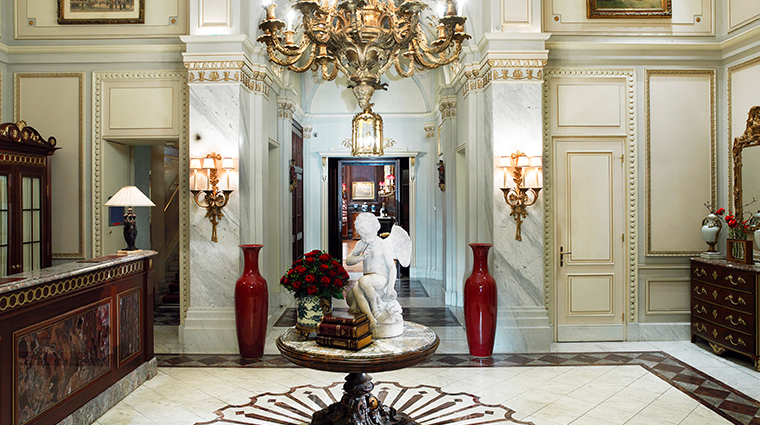 A stay in Hotel Sacher will transport you to another time and place. 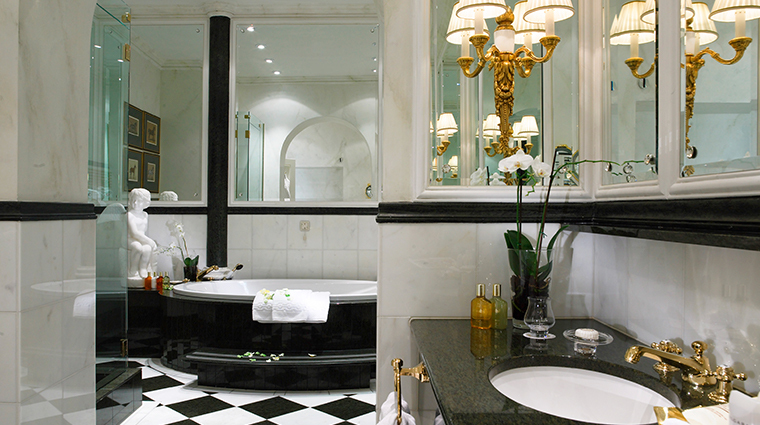 Yet even with the traditional style elements, the property sustains its deserved reputation with consistent updates and care for today’s guests. The 149 rooms and suites are color themed, with those on the sixth and seventh floors adorned in modern soft red and blue tones, while the suites and deluxe rooms on lower floors are in taupe and soothing green shades. 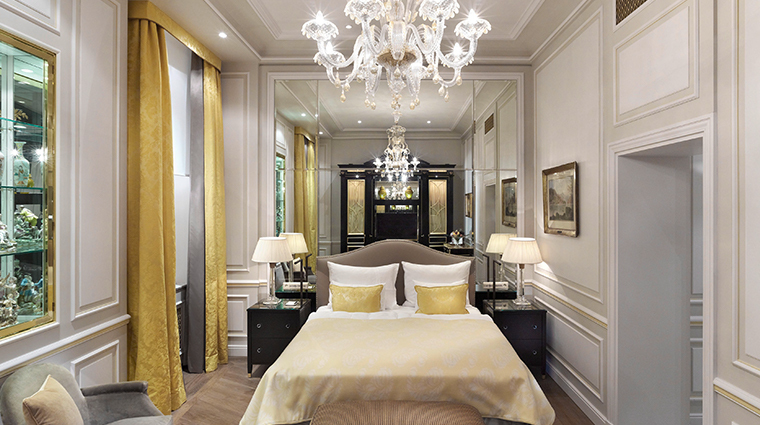 When requesting rooms, regular guests refer to their preferred color schemes rather than room numbers. 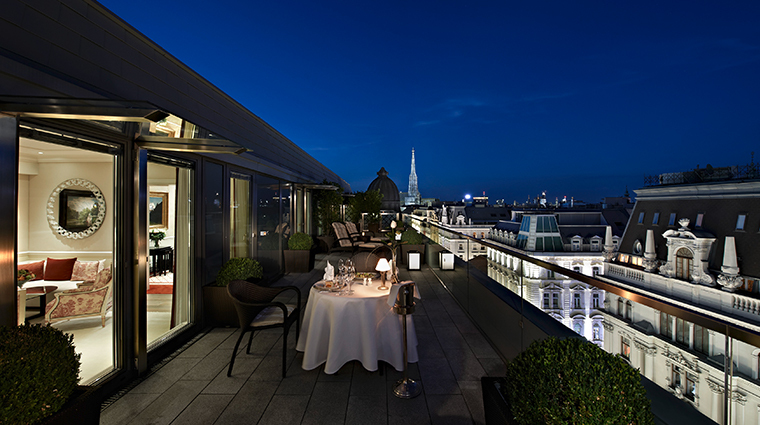 The seventh-floor Penthouse includes a rooftop terrace with clear views to the Albertina Museum, Vienna State Opera and the Stephansdom cathedral. Sacher Eck is the newest member of the restaurant family. The 2017-opened space, with its velvet red settees, offers a modern take on the Viennese coffeehouse experience without the fuss of traditional shops. 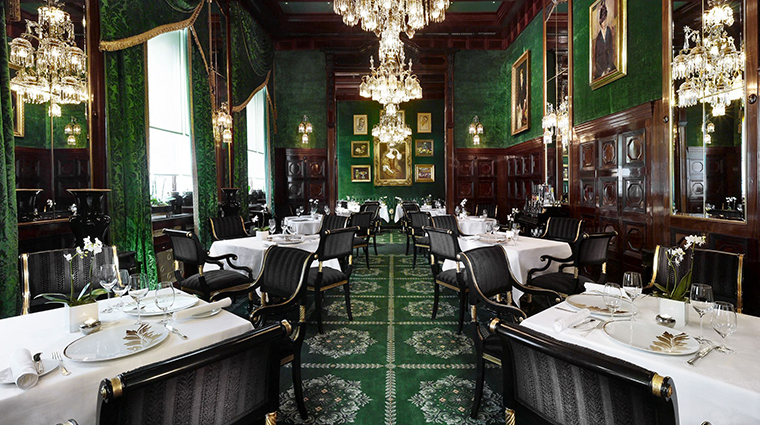 Home of the original Sacher torte, the hotel’s Café Sacher Wien should top all travelers’ must-see lists. You have to try the world-famous dense chocolate cake layered with apricot jam here. 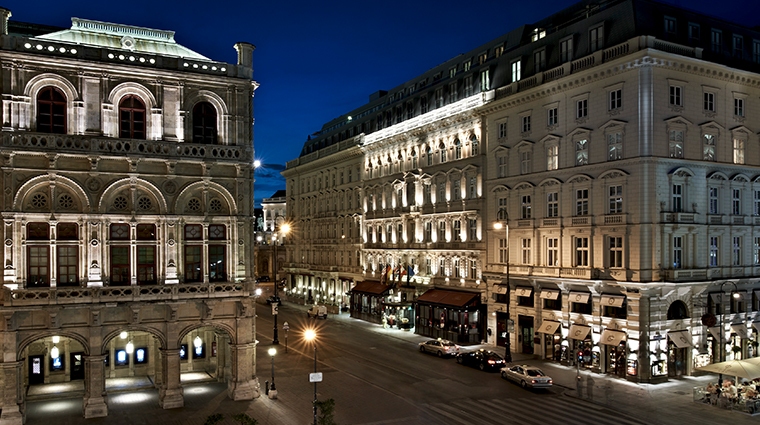 If you want opulent, Old World Vienna, this luxurious hotel delivers. The Sacher torte is a beloved chocolate cake. 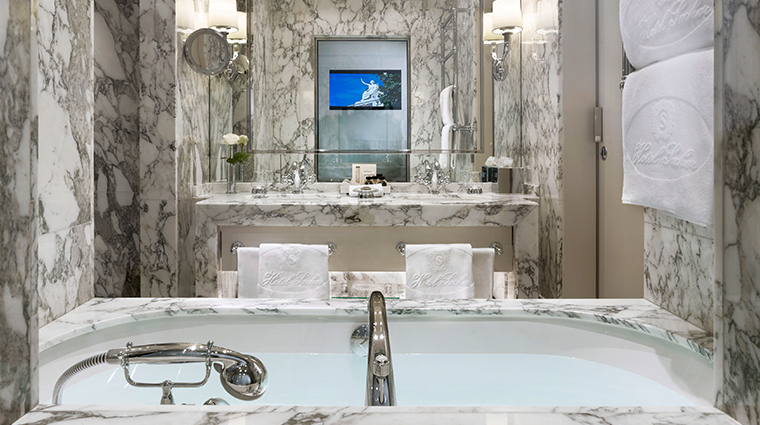 The hotel has its own dessert-inspired amenities in the rooms, with chocolatey bath and shower gels, body lotions and soaps. 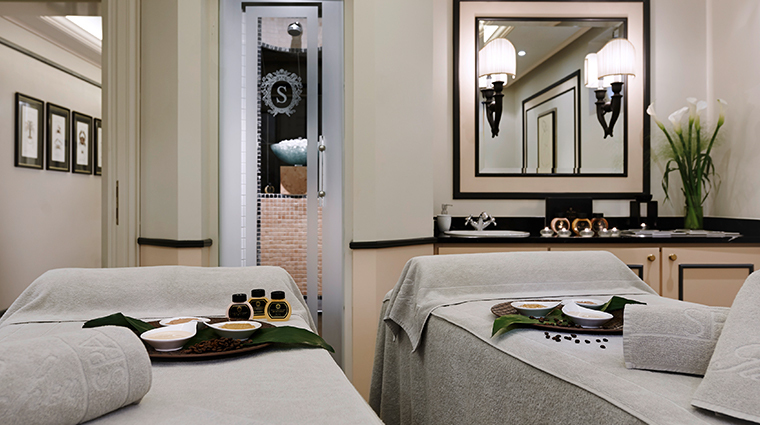 Dedicated spa elevators allow you to don rich monogrammed Sacher robes and descend to the fifth-floor boutique spa without fear of being noticed by other guests. 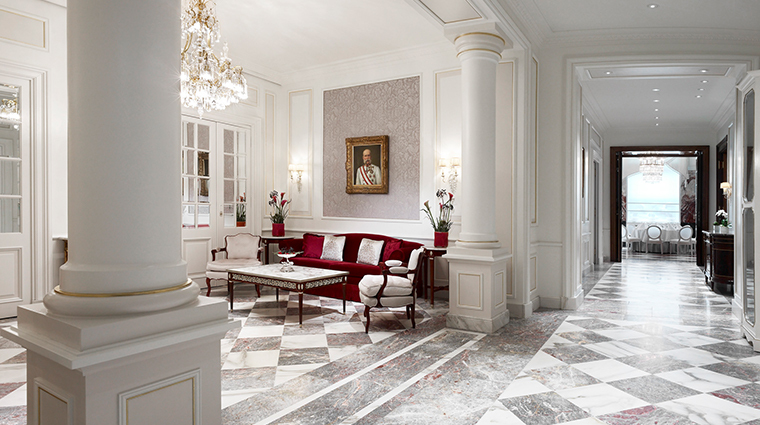 The famed portrait gallery and paintings throughout the Vienna hotel pay homage to famous past visitors (Indira Gandhi, John F. Kennedy) and the stalwart founder, Anna Sacher, who grew the property’s reputation to what it is today. 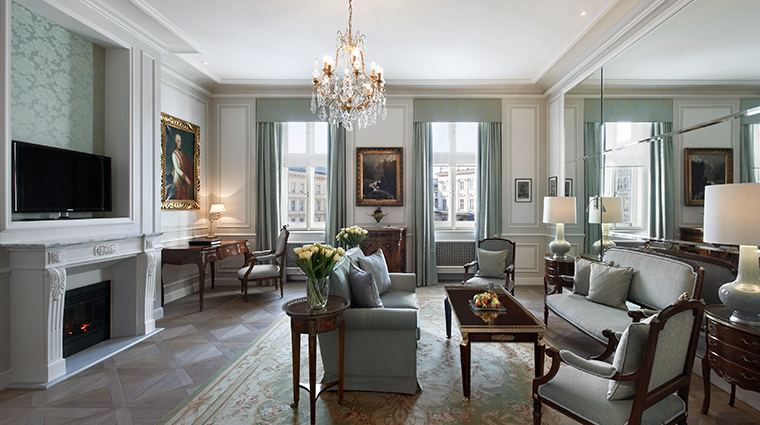 Sumptuous, refined and spacious, each room or suite in Hotel Sacher is slightly different, staying true to the architectural layout of the 1876 building. Parquet flooring, double-glazed windows and unbeatable views mean that even if you’re staying in an entry-level room, you’ll have a memorable visit. 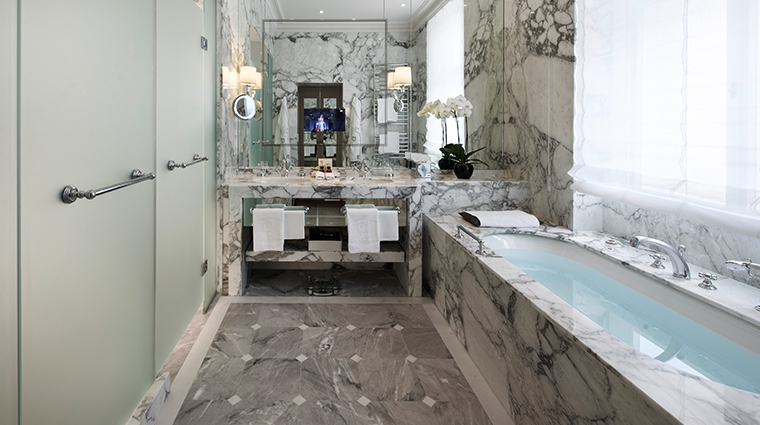 Mirror TVs are featured in each bathroom alongside rich marble sinks and rainfall showerheads. 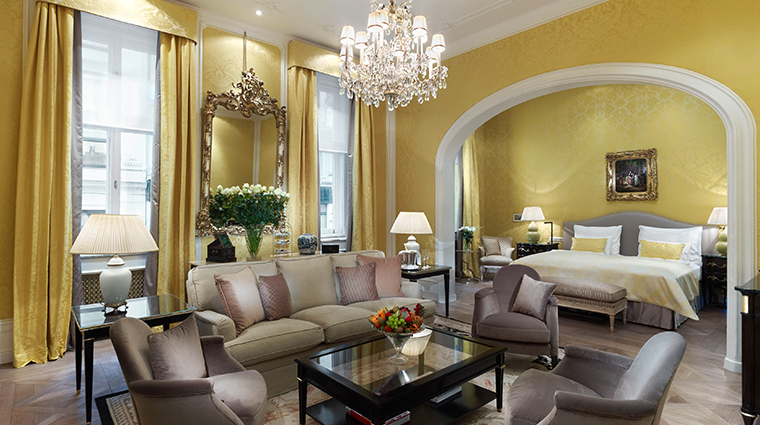 Antiques and original artworks are dotted throughout the spaces, giving you the sense of staying in an estate house, not a hotel. Restaurant Rote Bar serves diners in a grand ambiance. 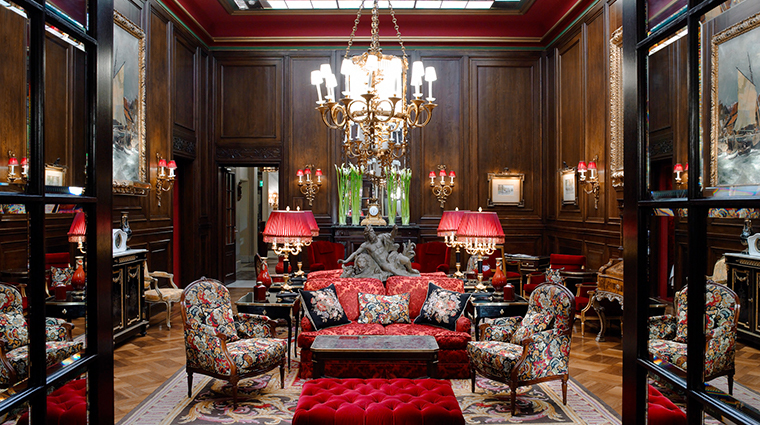 Opt for the black-and-white-tiled terrace or the opulent red-velvet- and chandelier-filled inner dining space. 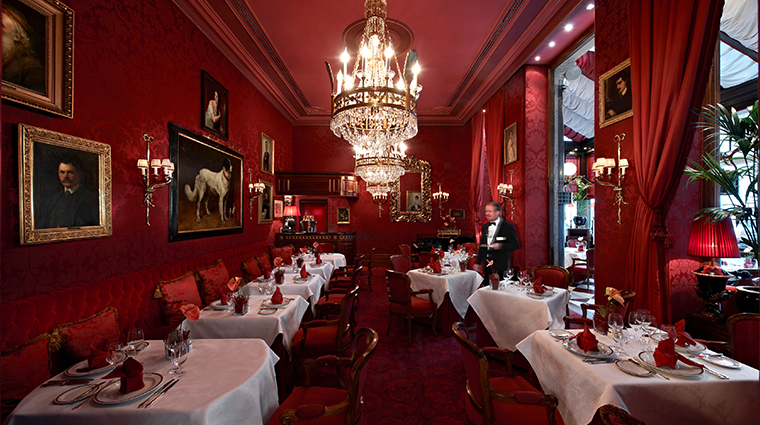 Either way, live piano music will accompany your exquisite Austrian dishes. 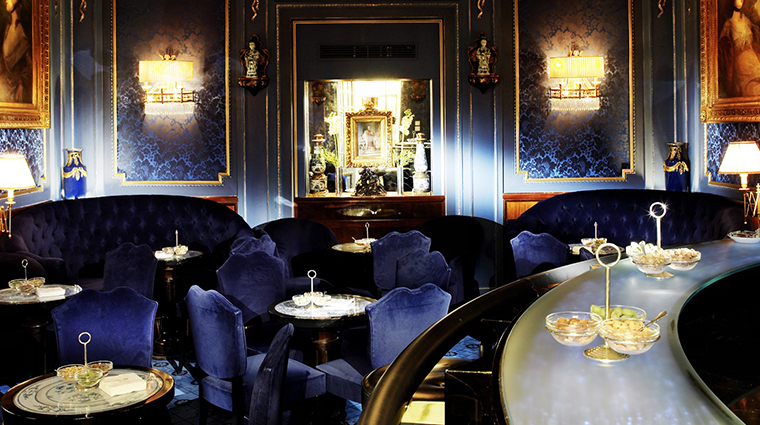 Restaurant Grüne Bar is a more creative take on traditional Austrian cuisine. The eatery presents chef Dominik Stolzer with just the venue for experimenting with local and seasonal ingredients. 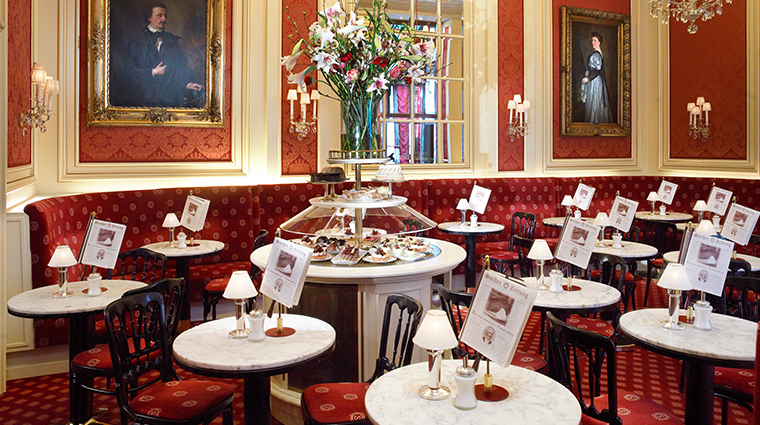 The famous Café Sacher Wien is open from 8 a.m. to midnight and is reliably filled with guests nibbling on the famous chocolate cake and sipping a cup of joe in a traditional coffeehouse-style setting.